In the Western province of Hyunia blood stains the Autumn snow. A wealthy Merchant has hired you to rid the world forever of the Talpun Family, a great clan rooted in honour and the military. You are Chu-Ku-No the great assassin, named after your trademark weapon - The Chu Ku No, otherwise known as the reapeating crossbow. I was heavily inspired by Tsubasa's Tale by Night Conqueror and I hope it shows through. Activate special powers with taunts. Interact in conversations with taunts. One main quest and many side quests. A video showing game footage montage from the scenario if you want to see some of the scenario before you decide on downloading it. This looks very promising, but you have not provided the immobile units AI that you used, which makes the game almost impossible to enjoy..
Also, in the video showcase there is some nice music playing, but no sound file was provided with the download. If you want the players to fully enjoy your game, I recommend that you provide all of the necessary files. By the way, you should save your game as a campaign (.cpx), and then there's no need to provide any AI's. I apologize for those mistakes. I was hideously tired when I uploaded these so they made a right mess of it. I've added the AIs and the sound file however I want to keep it as a scx file so people can play with it if they wish. I also renamed the AIs so they now link with the scenario. The update makes a big difference. I'll try to review it when I'm done playing. "Prints in the snow" is a classic RPG scenario, in the vein of "Tsubasa's Tale", with gameplay centered around boss battles and various sidequests. I am glad to say that it has by far surpassed my expectations. The game was very enjoyable, despite being relatively simple for an RPG. The author has succesfully borrowed elements from Night Conqueror's legendary scenario "Tsubasa's Tale", skillfully making them his own, most notably the boss fight scenes and the taunt based special ability. This is by no means a Tsubasa clone, but it bears some ressemblances. The story however is not emphasized at all (which in my opinion is the biggest letdown of the game). There are other problems which are common in RPGs such as long walking distances from one point to another. Also, the taunts system can be a little confusing for somebody who isn't used to it, and it might even kill the game if the player doesn't know he is supposed to have the "chat to all players" option checked. I highly recommend to the author to make this very clear either in the instruction or in the hints screen, to avoid people getting frustrated. The chat is one of the most important things in the game, and if you don't reply in time to a certain question, it might completely ruin your game. I enjoyed the game mainly because of the very good balance. I was challenged on several ocasions and all the boss fights had something interesting and challenging about them, which didn't allow for boredom. Perhaps something that could be worked on is the time that the player spends in between the boss fights. There are some interesting things that happen there, and also sidequests, but maybe some more fights would be interesting? Especially in the long periods of walking in between bosses. Fantastic. And I really mean it. I very rarely see such an amount of creativity in a scenario. There's lots of stuff that I haven't seen in a AOK game before, such as the maze idea (at least not in this format), and virtually every single boss fight is very creative. The ideas are simple but effective, and they are well executed. The designer shows very good use of triggers. I also found the wizard companion to be a nice idea, but the fact that he doesn't become player1 and his slow walk rate means he would often get left behind, which was a little annoying. It's pretty good, even though it lacks the "wow" factor. There are some nice map copied buildings (I liked the dock graphics used for a tavern) and some interesting landscapes, and map design contributed to the gameplay nicely, in several ocasions. The starting town is way too crammed though, the space between buildings is very narrow and it makes it very easy to get stuck. You might consider freeing up the space there a little. 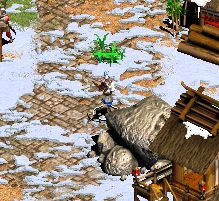 My biggest map design complaint is the use of palm trees, which look terribly out of place in the snowy landscape. Get rid of them and the map design will look a lot better for it. This is basically the only real letdown of the scenario. Such a good game deserved a much more developed story. The character you control is more or less a faceless one, he has no known background and is only referred to as "Chu Ko Nu". The enemies have a little more personality, the family members that you're supposed to assasinate one by one, but it would be a lot nicer if you actually had a good motive to do it, besides money. I mean, who are they? Maybe they're evil warlords or something? More background on the place where the action happens would also increase player's interest in the game. The dialogues with NPC's do a good job, but it's not enough. The instructions are provided in a decent manner, and hints are also helpful (except for the absence of the "chat to all" hint that I talked about earlier). This scenario is good, but it could be even better, and it has the potential to be great, if updated. I highly recommend this download for RPG enthousiasts. It's a fun way to spend an hour or two. A very promising start for CrusaderCrab, and I hope I'll see other designs from him in the future.